Look I’m an animal lover, but some species can really stretch a friendship! We have leeches in our garden when it’s wet and they seem to love me a lot more than I love them. 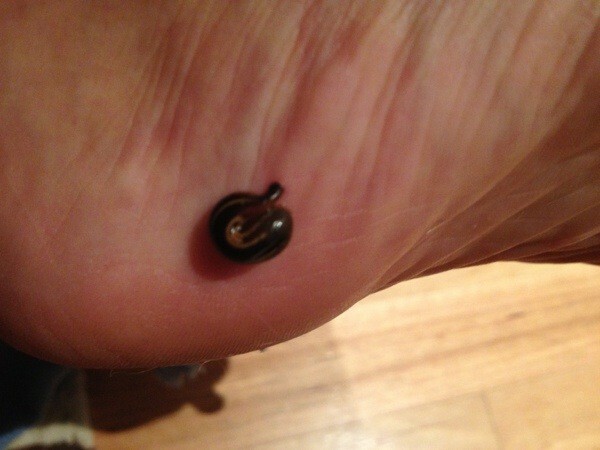 Did you know the leeches here in Australia have two jaws and leave a V-shaped wound? In other parts of Asia, they have three jaws, so at least that’s something. Leeches can ingest up to ten times their body weight in blood. The ones I’ve met certainly have a go at that. 1. Do not panic, leech bites are harmless, no diseases will be passed. 2. You can gently pull the leech off; push your finger against the sucker and gently roll it away. This is the humane method. 3. Or be cruel and put some salt on the leech’s skin, it will fall off and expire. 4. Wearing shoes will help prevent them attaching – note to self. 5. Don’t worry if the little wound bleeds for a while, that’s normal. Do worry if it becomes infected, visit a doctor. There are enough little creatures wanting me to feed them in this house. I really don’t have time for leeches. They are great for making your kids squirm and say ‘yeuch!’ though. Now have I ever told you about the time I was lost in the jungles of Borneo, wearing leech socks which proved useless? Lets just say that they invaded my knickers and there was blood everywhere. Anyone or anything bitten you lately? Do you have these little suckers in your garden too? A post on sea lice bites here – with photos of my thighs – sorry! We don’t have them in our garden thank goodness but I did get them (whilst wearing shoes) when we were out Stanthorpe way and got flooded in and couldn’t get home. I was not happy !!!! We found the first one just after we got back to the car but the second one must have been inside my shoe and I didn’t notice it until I took my foot out to put on the dashboard. Needless to say my scream nearly caused A to have an accident. I HATE the little buggers – with a passion !!! They do make your stomach turn, don’t they. Small but ‘orrible. I didnt even know we had leeches in backyards here..I thought they were just a jungles of Borneo thing that you saw in the movies and needed fire to get off! Not nice at all. I get the odd tick, but thankfully nothing much else. Lol, it’s amazing what you get used too. Everybody talks about the snakes and cockroaches in Aus but no one ever mentions the leeches! yeuk!!!! Wrong country I say! My kitty came in the other day with a leech under her chin (pretty sure it was a leech) – it wasn’t attached yet so we flicked it off. Heaven only knows where she got it from! Gross! I can cope with the odd leech when camping or bushwalking, but I think I’d be moving if they were in my backyard.